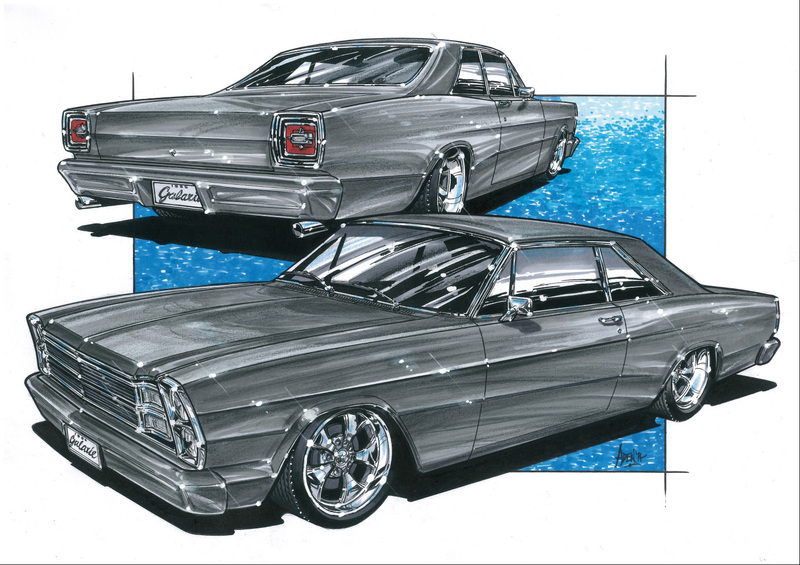 Over the last year or so I have been privy to see the design process and build of a uber-cool, 1966 Ford Galaxie at Cronic Customs here in Wangara, Western Australia. The car has since been completed and made it’s debut at the recent Hot Rod & Street Machine show where it was judged to be the best Street Machine ‘Show Car’ – the only trophy it was eligible for. It also picked up the Meguair’s Superstars award too. After the show, I was able to shoot the car for Street Machine. I won’t share any of the completed images until the magazine is due out next month, so in the meantime, here are some of the ‘in the build’ images and design stuff. The owner, Malcolm Niall, approached Adam and Cara Spiteri and the team at Cronic Customs to build him a street licensed (and engineered) machine to cruise the sunny streets of Perth. It was to be powered by a modern powertrain and drive like a new car with all the creature comforts to boot. The car was delivered to Cronic Customs in standard form for a complete overhaul. Cronic Customs oversaw the entire build process, with the Panel and Paint side of things to be taken car of by Calmack Panel & Paint and the interior was to be trimmed by Drew Menzies at Northside Motor Trimming. The chosen motor has been the quad-cam, 5-lite, Ford Coyote motor in a practically -standard form albeit for the Haltech ECU, the custom made, stainless steel exhaust system and the March Serpentine set up. To help that ‘big’ motor fit in, the stock strut towers were removed, as was the standard steering set up. The replacement is a TCI double-wishbone cradle and power-assisted steering rack with a Flaming River column. It didn’t all just go in there, no way. It all required custom work and some replacement parts from an early ’60s Mustang. The firewall has been smoothed and much later in the build, some metal magic was performed with removable sheet metal covers on both sides of the bay and a custom radiator support cover as well. More attention was made to some detailing tricks and fresh pieces prior to the show debut. Under the bonnet now has a real modern edge to it. One major talking point about the car over the build has been the aggressive stance and the amazing thing – there is not an airbag in sight! To get the car that low required a completely new tunnel which was raised four inches and a custom rear end set up which features a four-link assembly with a custom Panhard bar. Vikings coil overs have been fitted all round. The car now sits around 6-7 inches lower than when it rolled off the factory floor in the USA. More custom metal work has been applied to the body with the front of the Ford copping some unique treatment to the bumper. The centre section now incorporates an air dam and the number plate. The centre section of the rear bumper has been made to match the front and the original door handles have been shaved and replaced with a Kindig It Custom set from the US. The car runs 19 and 20 inch SW3 billet Showwheels with big Wilwood discs hidden out of sight. The interior of the big beauty didn’t miss out on the action either. Inside the ride now features a custom made centre section of the dash and the fascia wears Dakota Digital instruments. The air-conditioning controls and audio system have also been incorporated effortlessly in the build. The finished product is incredible, Drew Menzies did an awesome job but you will have to wait till the magazine is out to see the end result. Once the car was completely sorted and driveable, it was pulled apart and sent it off to be painted and trimmed – which is the exact way it should be done if you are building a car of this calibre. All that is left now, is a final inspection and the car is well and truly ready for the road. It was a real privilege to shoot the car for Malcolm and the team at Cronic Customs and it has been awesome to follow the build and to have some input into the creative process on the car too. I can’t wait to share with you some of the images from the shoot – they look amazing!